Siberian Journal of Life Sciences and Agriculture (Print ISSN: 2658-6649, Online ISSN: 2658-6657) is a multi-field dedicated peer reviewed scientific journal designed to promote both fundamental and applied regional achievements in the field of medicine, biology, agriculture and related sciences on the territory of the Russian Federation and abroad. The journal has been published since 2008 by the Science and Innovation Center Publishing House. The journal is administered by the State Autonomous Healthcare Institution "Dental Clinic No. 2" (Naberezhnye Chelny, Republic of Tatarstan, Russian Federation). Periodicity. 4 issues per year (since 2017). For the purposes of publication, the editorial board of the journal selects reviews, analytical articles and original research papers as well as brief reports and professional reviews on most significant achievements in the field of medicine, biology. A wide range of problems appearing on the pages of the journal is determined by its social and scientific-and-practical orientations. In order to organize a quality scientific review of the submitted articles, the priority interests of the journal include manuscripts on three fields of science (Agronomy, Medical and Life Sciences, Clinical Medicine). At the end of 2015, Siberian Journal of Life Sciences and Agriculture was modified to meet the recommendations made by the international experts of the Scopus database. Since that time, the journal has been updated, which affected not only its design, but also the editorial board and reviewing staff, editorial policies, topics and principles for the selection of published articles. The members of the editorial board are acknowledged Russian and foreign scientists, who actively participate in the formation of the international profile of the journal. At present, we are actively engaging foreign colleagues in collaboration and are aimed at renewing the editorial staff on a regular basis. To ensure the quality of the published papers, the journal has established strict ethical requirements for manuscripts that conform to the standards of the respected international associations. In addition, aggressive peer reviewing (i.e. double-blind peer review method) of all submitted manuscripts has been introduced. The articles accepted for publication go through a full cycle of editorial processing and proofreading. All publications are reviewed and accompanied by an extensive resume in Russian and English. The editorial board of the journal accepts the texts by both Russian and foreign authors in either the Russian or English languages. The journal has an international and interdisciplinary nature. The journal focuses on publishing studies by Russian scientists concerning the issues of fundamental and applied research in clinical and preventive medicine and biomedical science. We do not rigidly limit ourselves within the Russian scientific framework and publish papers based on a wide scope of comparative material. The journal works for becoming a platform for publishing new breakthrough research works, carried out using a comparative study of the materials obtained from all around the globe. The mission of the journal is to unite scientists’ research efforts aimed at studying topical issues of biomedical science, as well as contribute to discussion and popularization of this field of knowledge by providing open access to published articles. Unlike other periodical scientific periodicals published by academic institutions and medical organizations, the journal focuses primarily on regional topical issues, considered in a wide range from pilot innovative research activities to large-scale implementation of scientific research results into practice. to encourage young researchers to become a part of the professional community. Relevance, interest to the public, novelty of the proposed ideas and scientific certainty of the materials presented are the criteria that the submitted manuscripts have to meet to be published. The mission of the editorial board is to provide opportunities for a well-posed and well-founded discussion of the most topical issues that would include presentation of different types of discourse as well as different research approaches. The decision to accept the article for publication is made by the editorial board taking into consideration the opinions of leading scientists, being reviewers and experts, who assess the article according to the above-mentioned criteria. The authors of the journal are major scholars, internationally recognized leading scientists, physicians of various profiles. The journal also provides an opportunity for postgraduate students and young scientists to have their papers published. Such articles are also published provided they conform to the above-mentioned criteria and editorial policies. The journal allows the authors to have the results of their scientific research published, and thereby it contributes to the formation of research teams united around the study of specific issues. The importance of the problems modern society is facing has been consistently discussed not only in the academic discourse. Therefore, in addition to the academic audience, the journal is also aimed at non-academic readers interested in discussing the fundamental problems of modern society, biomedical and related sciences. As the journal is working for becoming a platform for full-scale discussion of these problems, it follows the policy of open access to its publications. Since 2016, all contents of the journal are available free of charge to its users on the journal's official website (http://discover-journal.ru/) upon publishing the issue. The users are allowed to read, download, copy, distribute, print, search and find full texts of the published articles without the prior permission of the publisher or the publication’s author. Both the full-scale discussion of problems and open access policy suggest that the journal is ready to publish not only original scientific articles in Russian and English on the results of fundamental and applied-theoretic research in the field of medicine, biology, agriculture and related sciences, but also review papers made by leading specialists in the fields of knowledge related to the profile of the journal as well as professional reviews of new books and scientific research, materials of scientific events, discussions and round tables devoted to the issues covered by the journal. The journal publishes scientific papers of different formats (types) solely in accordance with its academic profile. Articles can be submitted throughout the year at PERSONAL ACCOUNT online. Registration - Mass media registration certificate PI № FS 77 - 71726, issued November 30, 2017. Subscription index in the "The Russian Post" General catalog - P9201, "SIB-Press" – 94089. Each issue of the journal is to be submitted to the Russian Book Chamber (ITAR-TASS branch) for both state and bibliographic registration, as well as to other leading libraries, educational and scientific institutions of the Russian Federation, CIS countries and abroad. Since 2017, an electronic copy of the journal is submitted to the Information Telegraph Agency of Russia (TASS) and the Russian State Library. The published materials are also kept in the editorial office of the journal, which ensures both the permanent deposition of published scientific articles and their availability. The journal was included in Agris and Chemical Abstracts international databases. 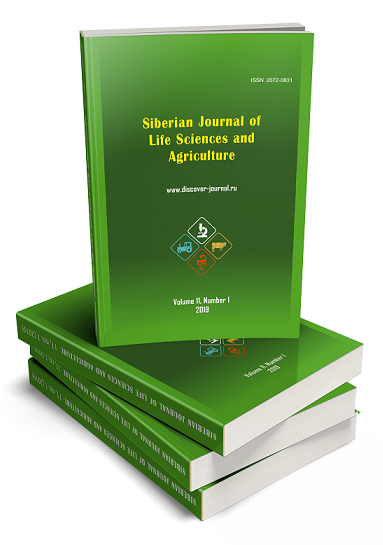 Articles publishing in the Siberian Journal of Life Sciences and Agriculture is carried out in accordance with the Creative Commons Attribution License, CC BY-NC-ND 4.0. The journal is included in the Abstract Journal and database of the All-Russian Institute for Scientific and Technical Information (the VINITI), being a subsidiary of the Russian Academy of Sciences. Information on the issues of the journal is available in the VINITI catalogue. Information concerning the journal is published annually in Ulrich’s Periodicals Directory (the international reference system on periodic and continuing editions) for the purposes of informing the world’s academic community. 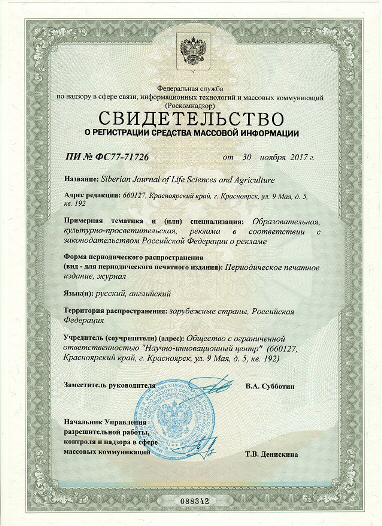 The Siberian Journal of Life Sciences and Agriculture is included in the Russian Scientific Citation Index (RSCI) and is presented in the Scientific Electronic Library (www.elibrary.ru). © Science and Innovation Center Publishing House. All Rights Reserved.